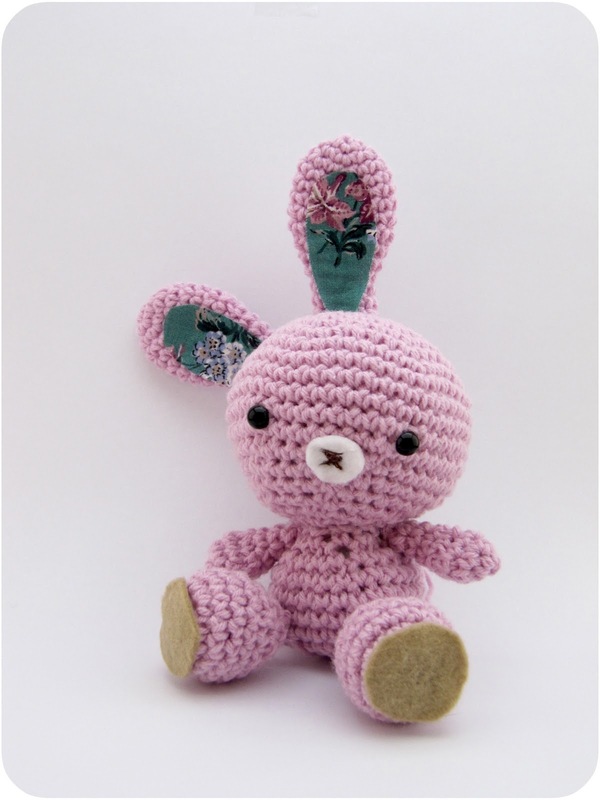 Crea in the City: Flashback, amigurumi fun! One of my first blog posts was about this little amigurumi sheep that I made. So funny to see this post, it's a totally different style. Written in Dutch *so happy I changed to English* and with limited text and pictures not taken so well. But of course I didn't realize that other people would follow this blog! And here we are, 32 followers! Wow, hahaha. But since this post about the little sheep, many posts have gone by without amigurumi in it. That's a pitty, cause I find amigurumi so cute. So I started to think about a cute project and I found this on pinterest! What a cute little bunny and with a free pattern. I used Katia Mississippi yarn and it is half cotton half acrylic. It is to die for! Normally I use "cheap"acrylic yarn from Bravo, Annell Rapido or private label from "Zeeman" or "Wibra". The acrylic yarn tends to be more fuzzy and for amigurumi that is not so great. It came out quite neat thanks to this yarn. Mine is slightly different than the one in the pattern, but I think it is still cute! Wanna see? It did distract me from my One a day project though, shame on me ;-). I will catch up on that this weekend! Have a great weekend yourself! Wow, that is very cute! I like to use cotton for ami stuff, and when I do use acrylic for things now, I never find I like the look of the stitches so much. I've never used a mix, I'll have to look out for some. Now get back to work on you one-a-day, fancy slacking already after only two weeks ;-) .....I would never do a thing like that! Simply adorable. A marvelous excuse for a break from your big project. I had noticed you wrote in dutch in early blogs, I think its cool for people that have more than one language...I find it fascinating!